LMA were appointed for this unique project which involved the provision of accommodation for workers on the adjacent industrial site as well as provision for a future training centre. Situated just outside of the Pontcysyllte World Heritage site, the principle at the centre of this design was to create a facility that sits comfortably within the landscape but remains subordinate to the adjacent existing stone farmhouse. 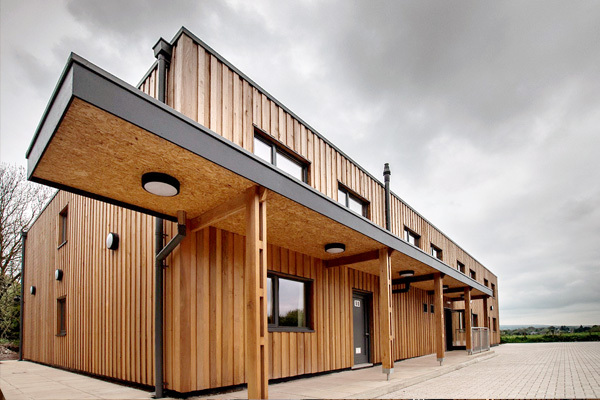 The building sits low in the landscape, where materials such as the red cedar boarding were chosen to compliment the colours and textures of the surrounding area. The building was prefabricated and used many products which are produced by the client themselves.